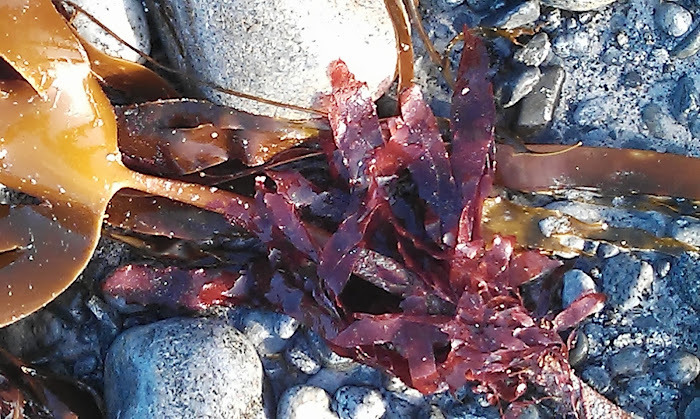 Sadly, the warming Atlantic Ocean poses a serious threat to the coastal beds of the brown seaweed, kelp. Seawater temperature is critical for kelp survival. The cooler the water, the higher the amounts of dissolved nutrients. This is good news for kelp growth. Global seas are reacting to climate change differently on different continents. In Europe, considerable warming is causing the kelp forests to disappear. The ocean floor of the Hebrides with its gently shelving rocky basins between many of the islands, provides a habitat that is especially suitable for kelp. Kelp forests cover an enormous area of the Hebridean sub-tidal seabed. These forests are occasionally exposed at exceptional low spring tides. The kelp forests (Order Laminariales) appear dark and forbidding but in their tangled underwater jungle there is order. The seaweed gatherer will first pass oar weed (or tangle) Laminaria digitata and then, on wading or swimming further out, the forest kelp (or Cuvie) Laminaria hyperborea.The holdfasts (think terrestrial plant roots) of the larger kelps look like the crooked roots of an aged tree. 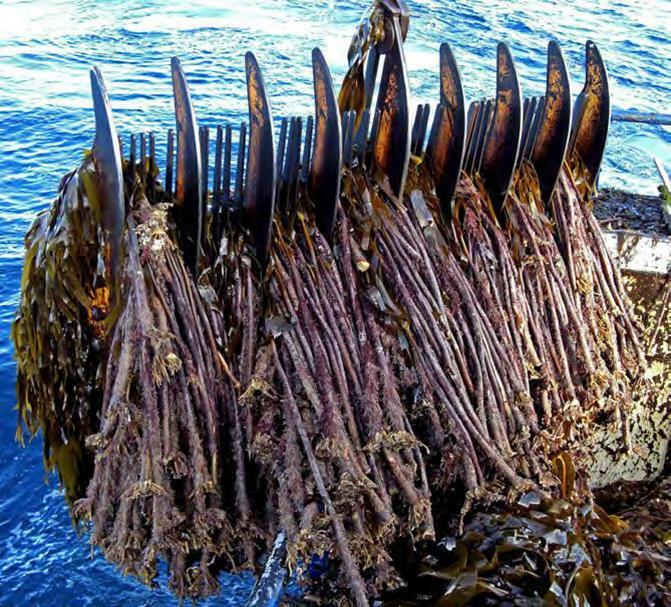 These kelps have strong stipes or stalks, which support their branching slippery, amber fronds. Kelp forests provide homes to fauna and seaweed epiphytes like dulse, which often hitches a ride on a rough kelp stipes. At high tide the L. hyperborea kelp stipes are reminiscent of the guards at Buckingham Palace as they stand to underwater attention. Their fronds dance and provide shelter for darting fish playing hide and seek. Kelp also hosts lunch, supper or tea for many invertebrates, like the blue ray limpet. But then, twice a day as the tide retreats, the party is halted as most of the seaweeds collapse and fall flat on the seabed. Some seaweeds lie upon sand and others hang from rocks but all await the surge of water, which will once again, hold larger stipes erect and enable the seaweed fronds to flap and return to the Marine ball. Cuvie, Laminaria. hyperborea and Tangle, Laminaria digitata are the most dominant kelps that I spy on foraging expeditions at an Outer Hebridean low spring tide. The rise in temperatures and increase in storms caused by climate change may damage these hidden ocean forests. This is bad news because the kelp forests break the flow of seawater, and this in turn helps to prevent coastal erosion. A paucity of seaweed will leave coastlines open to the damaging effects of the sea, which will reduce the stability of the land. Inhabitants of the kelp forests are of course at risk of losing their habitat. Global warming is worrying. However, a scoping report (July 2018 ) prepared for Marine Biopolymers Ltd may also threaten Scottish Kelp forests. It is suggested that the seaweed canopy will regenerate in 4 years but my question is: will the marine communities recover. When I was researching Seaweed in the Kitchen I passed a few e-mails with James Estes, we discussed sea otters in the Aleutian Islands. They were wiped out by the fur trade in the 1990s. This posed a seaweed problem. Sea otters eat sea urchins and sea urchins eat kelp. When sea otters are present, the coastal kelp forests maintain a healthy balance. However with the demise of the otters, sea urchins in the Aleutian Islands dined on kelp wildly, and as a consequence the kelp forest collapsed, as did everything that depended on it. The sea urchins ruled the roost once their predators disappeared, but their grazing prevented the kelp from regenerating. Fish populations declined. Ecosystems are built around interaction webs within which every species influences many species. 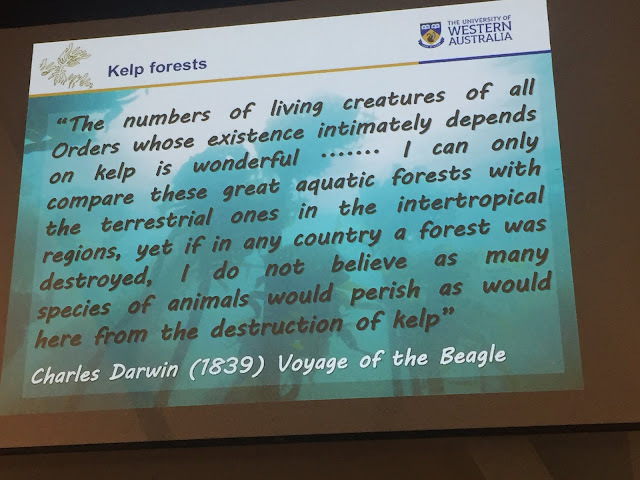 We need to have a very good understanding of the regeneration of our kelp forests before we allow our ocean gardens to be mechanically dredged. In the interim we must say NO to mechanical kelp dredging and demand evidence based research. Cook the kelp in a pressure cooker until tender and immediately refresh in iced water. Put all the other ingredients (apart from the kelp) in a small stainless steel pan and heat on the hob for 2-4 minutes to dissolve the sugar. Leave to cool completely. 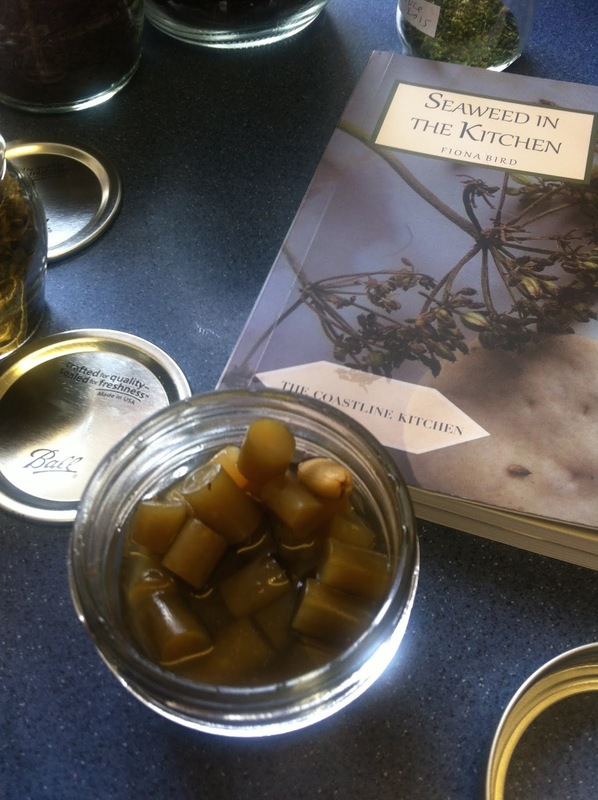 Put the kelp in a sterile jar(s) and pour the pickling liquid into the jar. The kelp will sink, leaving about 2cm of pickling liquid at the top of the jar. Don’t be tempted to add more kelp because the lengths, with time, will distribute evenly. Seal the jar with a non-metallic vinegar proof lid and leave in a cool dark place for at least 6 weeks before using. Shake the jar when you remember to. If you can wait, a couple of years before using the pickled stipes. It will be worthwhile - young stipes age well.